After dipping last week, stocks are back up after Fed Chairman Ben Bernanke announced that the Fed would continue its easy-money policies this year. I’ve already noted how the money supply (M2) is growing rapidly, all apparently in an effort to re-elect President Obama and to help Bernanke keep his job. As a result, the U.S. government is running massive deficits to pump money into the economy. The situation is reminding me of 2008, when the Fed lost its political independence during the Great Recession. In the short term, this stimulus is showing positive results. Employment is recovering slowly and real gross domestic product (GDP) is advancing at a 2-3% rate. The slight economic improvement might well be enough to re-elect President Obama. At the same time, prices and interest rates are moving back up. The consumer price index (CPI) is up 3-4% a year and interest rates are climbing across the board. Last week, I spoke at the Investment U conference at the Grand del Mar Resort near San Diego. As master of ceremonies, I had the chance to listen to all of the general session talks by such experts as Rick Rule, Keith Fitz-Gerald, Alex Green and Karim Rahemtulla. Like all investment conferences, there were bulls and bears taking sides on where the markets were headed, with Keith Fitz-Gerald taking the optimistic view and Eric Sprott making the case for a bear market. One of the hottest debates was on China. Keith Fitz-Gerald, Lou Petrossi and Frank Holmes argued that China’s economy would continue to grow, though at a slower pace, but would not suffer a financial meltdown. Carl Delfeld and I countered that China has engaged in artificial stimulus that can’t last, just as the real-estate boom in the United States didn’t last. One of the most fascinating talks was by Lou Basenese, who talked about the incredible advances in technology that are coming these days. Lou spoke about a surprising new technology, 3-D printing, which actually simplifies manufacturing tools that require new specifications. The technology is quite a breakthrough. He also talked about a medical breakthrough that can let a sophisticated new printer use biological material to grow tissue to treat medical conditions. Who says that the world of technology is stagnating? “You Blew It!” — Obama for Working Americans? I laughed when I saw this new ad headline for Barack Obama’s re-election campaign. The Obamas are standing up for working Americans? Well, maybe so, since they have done nothing for the unemployed. The unemployment rate has remained stubbornly high since Obama took office. In fact, the unemployment rate for young people seeking work has skyrocketed (due in part to the 40% rise in the minimum wage, which worsens unemployment among the young, the unskilled and minorities). Maybe they mean the working poor and middle class. Obama favored the extension of the middle-class tax cuts. Yet the cost of living continues to rise, especially the price of gasoline (now over $4 a gallon). The rising price of gasoline can’t be good for working Americans. And the Obama administration has discouraged companies from hiring workers because of new regulations, such as ObamaCare and Dodd-Frank. Maybe they mean union workers. They are the only group of workers who have consistently supported President Obama’s re-election. My wife and I are working Americans, but he is determined to raise our taxes substantially (for anyone earning more than $250,000 a year). 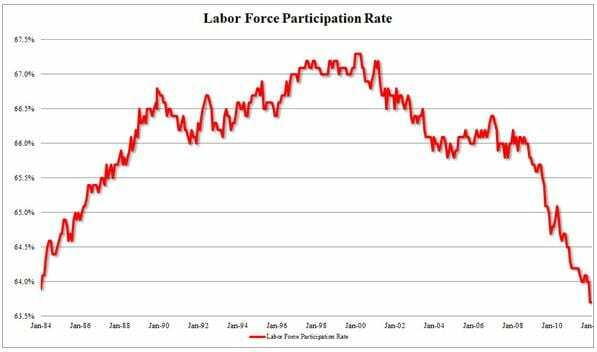 The fact is the percentage of Americans participating in the labor force has declined to 63.7%, its lowest level since the Great Depression. (See chart below.) In fact, in February, 1.2 million people dropped out of the labor force in one month! The unemployment rate, now at 8.3%, is gradually declining but only because Americans have stopped looking for work. The unemployment rate is a percentage of the labor force, which is shrinking at an alarming rate. Exclusive Making Money Alert: The Fed: To Infinity and Beyond! As a new subscriber to Dividend PRO, you're probably curious about the "forbidden" income strategy that can boost your income returns to your Dividend PRO holdings.